I really miss authentic Mexican cuisine. Having grown up in Los Angeles, you can find that the worst hole in the wall looking restaurant serves the most fabulous tacos, tamales, enchiladas and soups. I have been missing my hometown and thought that a Pork and Green Chile Soup with a side of cornbread would make me less homesick. I was right. The perfect combination of tender pork with tomatillos, green chiles and cilantro can make me sing from the hills, well maybe not the hills but at least from my kitchen. Remove excess fat from the pork loin. Place pork loin in crockpot, add all ingredients except for cilantro, sour cream, and avocado into a in a 4 quart crockpot. Stir well. Cook on low 6-8 hours or on high 3-4 hours. 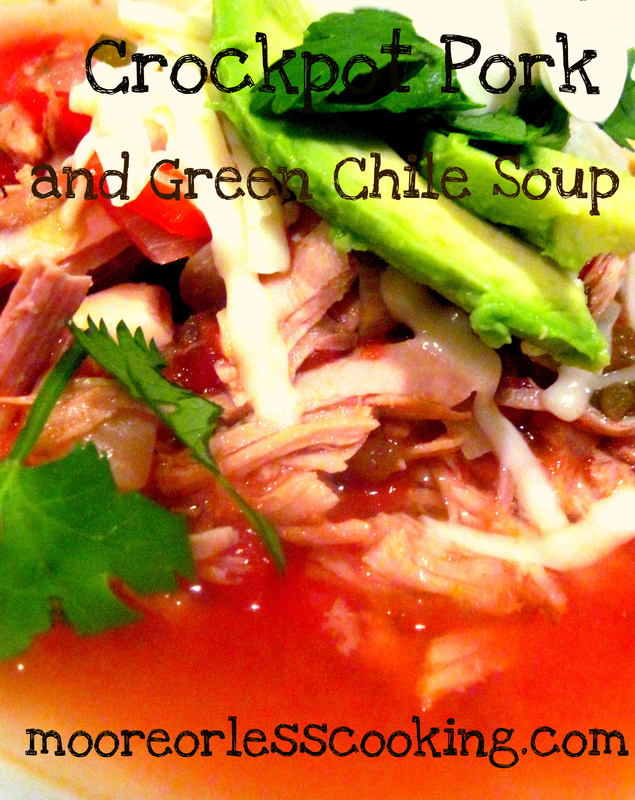 Serve soup with a couple slices of Avocado, shredded jack cheese,cilantro and a dollop of sour cream. My favorite thing to do on a cold rainy day (like today) is to have a warm hearty soup going in the crockpot. I don’t have a recipe anything like this one. Can’t wait to try it.